Take an early morning excursion trip to Amber Fort. Amber Fort is a magnificent fortress constructed on the top of a hill in the outskirt of the city. Enjoy battery van ride to ascend the fort complex. Return to hotel en route visiting the palatial Jal Mahal Palace. After enjoying the breakfast proceed for the Jaipur city tour. Jaipur is the largest and capital city of Rajasthan and fondly known as the Pink City of India. Drenched into royal grandeur and glorious past the city of Jaipur is internationally famous for its magnificent forts, palaces, temples and other monuments. Major attractions to see in this city include City Palace Complex, Govind Devji Temple, Hawa Mahal (the Palace of Winds), Jantar Mantar Observatory (world heritage site), Birla Temple, Ramniwas Gardens, and Albert Hall Museum. Explore local bazaars in the evening for shopping overnight stay at the hotel. After enjoying the breakfast then drive to Udaipur - a beautiful city in Rajasthan. Udaipur is fondly known as various nicknames such as the City of Lakes, the City of Dawn, the City of Rising Sun, the Venice of the East and the Kashmir of Rajasthan. It is also considered to be as one of the most romantic cities in India. Reach and check in at the hotels. Overnight stay at the hotel. After enjoying the breakfast at the hotel then proceed on sightseeing tour of Udaipur. The major attractions like City Palace, Pichola Lake, Jagdish Temple, Lake Palace, Jagmandir Palace, Saheliyon-Ki-Bari, Monsoon Palace, Vintage Car Collection, Bharatiya Lok Kala Mandal, etc. Overnight stay at the hotel. After the breakfast you will be transferred to Udaipur airport to board flight for Mumbai - the capital city of Indian state of Maharashtra and financial capital of India. Spend rest of the day at leisure. Overnight stay at the hotel. After the breakfast later proceed for full day sightseeing tour of Mumbai - the Dream City, in Hindi, Maya Nagari. 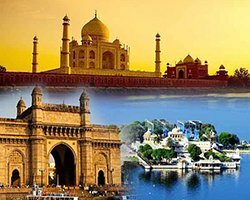 Major attractions to see in this city include Gateway of India, Elephanta Caves, Victoria Terminus, Prince of Wales Museum, Kamal Nehru Garden, Hanging Gardens, Juhu Beach, Chowpatty Beach, Marine Drive, etc. Also visit the film city. Mumbai is home to Bollywood - India’s biggest film industry. Overnight stay at the hotel. After having the breakfast at the hotel, pack your baggage for Aurangabad Airport and then transfer you to the prearranged hotel. Freshen up and relax. Visit the Bibi-Ka-Maqbara. Then take excursion to famous Ajanta Caves - world heritage site. Overnight stay at the hotel. Have a very hearty breakfast at the hotel. Take half-day excursion to Elephant Caves - world heritage site. You will see many finely sculptured & rock-cut temples. In the afternoon proceed on Aurangabad tour covering Daulatabad Fort and Aurangabad Caves. Overnight stay at the hotel. Have a relaxed breakfast at the hotel. You will be transferred to Aurangabad Airport in time to board flight for Mumbai. On arrival in Mumbai, check-in at the hotel. Spend rest of the day at leisure. Overnight stay at the hotel.